In anticipation of Larry Levine's session at the Outbound Conference this week we're talking about the importance of getting valuable before you get visible. As sales professionals we all want to be seen by our prospects. However, we must be careful to make sure we are bringing value. What can that value look like? 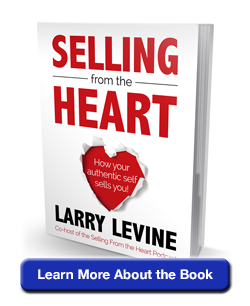 Welcome to the Selling From the Heart podcast, your home for authentic, effective, and socially-integrated sales strategies to help you master the art of selling. Join your hosts Darrell Amy and Larry Levine along with some of the world's best sales thought leaders and practitioners as we explore ways to grow your sales.